For the All Progressives Congress (APC), this is an anxious moment. Reminiscent of the pre-2015 election period, when the new Peoples Democratic Party (nPDP) sprang up to liquidate the acclaimed largest party in Africa, some chieftains yesterday announced the formation of the ‘Reformed APC’ to coordinate the onslaught against the President Buhari-led government. APC National Chairman Adams Oshiomhole, who tried frantically to avert it, now has a big challenge on his hands. Can he stop the predictable defection from the APC? Can he avert the disintegration of the ruling party? Can he persuade the aggrieved chieftains to sheath their swords? What is the way out of the logjam? According to observers, the APC has no formidable competitor in next year’s elections; it is now evident that it has so much trouble to deal with within than without. Prominent APC chieftains have constituted themselves into a curious internal opposition within the fold. Thus, while APC appears unperturbed by the activities of the main opposition party, the PDP, and other smaller rivals, it can only ignore the antics of its internal opposition leaders to its peril. According to The Nation, the bone of contention in the APC is not ideology. Neither is it the welfare of the common man. There is a clash of ego. Those fighting within are fighting the battle of relevance and survival. They crave for more party powers and access to the inner corridor of power, where President Muhammdu Buhari, who seems to have a different vision and mission, is aloof and indifferent to their cravings. Senate President Bukola Saraki is on trial for alleged corruption. He has also been linked with bandits who broke banks in the deadly Offa robbery. He expects a sympathetic presidential ear. 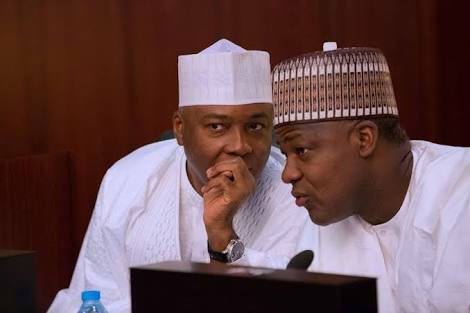 The Bauchi home front is hot for House of Representatives Speaker Yakubu Dogara, owing to the war of attrition between him and Governor Muhammed Abubakar. He believes the President should intervene on his side. Members of the so-called ‘Reformed APC” have returned to the drawing board. The pre-2015 tactics of the nPDP is on their palms. The defection ravaged and devastated the then ruling party. When nPDP members dumped their former camp en mass, there was no remedy. Therefore, the “Reformed APC” or put succinctly, “nAPC,” is on a familiar path. Defection can only be condoned under the law if there is crisis in the party. Yet, the APC has been surviving its crisis, including the furore over congresses. The onus is now on the Reformed APC to orchestrate a crisis as a prelude to its final decision to jump ship. A shift of allegiance to a new party is legally permissible. But, it is at a cost. The parliamentary defectors forfeit their seats. But, if they can manage to successfully instigate crisis, they can hold on to their legislative positions, just as former House of Representatives Speaker Waziri Tambuwal did and escaped sanctions in 2014. Those behind the new plot are skilled in the art of defection to score some points. Former nPDP leader Kawu Baraje is ready to fuel the ‘rebellion’ with his rich experience. To observers, the doomsday was only postponed. Since the beginning of the Buhari administration, the APC has been fighting internal battles. The party was nearly suffocated in an atmosphere of strife and rancour. Although it has the majority in the National Assembly, it has never translated that to cordial relations between the legislature and the executive. In the past, the logjam was attributed to the weakness of the party caucus, which should have moderated the tension between the presidency and the National Assembly. Also, reconciliation in the APC has been slow. Many stalwarts are erecting obstacles on the way of the process. When he assumed the reins last week, Oshiomhole promised to swing into action. Already, those who are likely to defect are locked in partisan fraternity with the PDP. The motivation is personal interest, which is fundamental in politics. There is a realignment of forces. Also, there is a clash of permutations. When the national convention was going on in Abuja, Senator Rabiu Kwakwanso was meeting with the PDP presidential aspirant, former Vice President Atiku Abubakar in another location. Just this week, Tambuwal was holding court with Rivers State Governor Nyeson Wike in Port Harcourt. Saraki’s Chief of Staff Hakeem BabaAhmed called it quits with the APC. What next? It is believed that the aggrieved chieftains have made up their minds to defect. But, the defection is still being delayed for strategic reasons. Can the new national chairman stem the tide? If potential defectors bid APC farewell, will it herald the disintegration of the ruling party? Will the defectors go back to the PDP? Will the PDP change its name as it is being speculated? Will the defectors team up with former President Olusegun Obasanjo? Will their defection cripple the APC? Will it abort President Buhari’s second term ambition? The days and weeks ahead will tell more.